If you want to give your taste buds a real treat, try one of our new grilled Panini sandwiches. We'll build your favorite from our wide selection of ingredients, beginning with our made-from-scratch breads and finishing with fresh meats and special fixin's. Once your sandwich is built, we'll slide it into our Panini toaster, leaving it there until both top and bottom are toasted to a golden brown. It doesn't get any better than this! Turkey breast and bacon with chili mayo, shredded lettuce, tomato and onion on your choice of bread. Turkey breast, sliced ham, provolone cheese, swiss cheese, mustard and sweet pickle relish on a white or wheat hoagie. A chicken breast, bacon, Co-Jack cheese with buttermilk, ranch and your choice of fixings on bread or in a wrap. Have it anyway you like. Three slices of premium cheese on your choice of your favorite bread with fixings. Shredded angus steak, havarti cheese, garlic mayo, with spinach leaves and tomato on a white of wheat hoagie. Sliced smoked ham, meunster cheese and a dijon-mayo sauce on sourdough bread. Turkey breast and Monterey Jack cheese with basil pesto sauce on sourdough bread. Add lettuce, tomato or onion, if you wish. 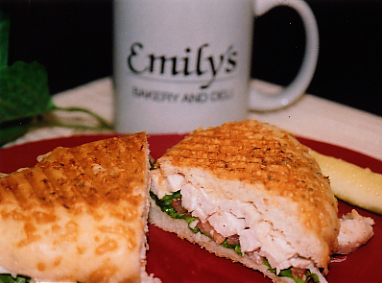 A chicken breast, bacon, hot pepper cheese with a pesto mayo, spinach leaves, tomato and onion on your choice of bread. Smoked ham and turkey with Swiss cheese on our cinnamon bread. Sprinkled with powdered sugar and served with grape or strawberry jam! A delicious sweet and savory sandwich. Sauteed peppers, spinach and tomato with smoked Gouda cheese and a creamy peppercorn dressing, grilled on our sunflower bread. Two pumpernickel silver dollar buns with corned beef, Swiss cheese and sauerkraut and your choice of 1,000 island or horseradish dipping sauce (order with turkey and call it a Rachel).